In 2016, there were more dog bite claims in Florida than any other state except California. Nationwide, these victims obtained a collective $612 million from homeowners’ insurance companies alone, an amount that has increased 70 percent since 2003. That increase has much to do with the skill of victims’ attorneys, escalating medical costs, and the types of injuries that these victims sustain. Even a medium-sized dog is large enough to knock over an older victim. After a serious fall, about half these individuals can no longer live by themselves, so both they and their loved ones face massive financial and emotional costs. These attacks usually traumatize younger victims. For months or even years thereafter, they must deal with nightmares, heightened awareness, flashbacks, and other PTSD symptoms. Florida is a strict liability state, so if their dogs bite, owners are “liable for damages suffered by persons bitten, regardless of the former viciousness of the dog or the owners’ knowledge of such viciousness.” In strict liability cases, victims do not have to prove negligence or fault. They only have to establish cause. Moreover, in some strict liability cases, jurors are more inclined to award punitive damages, a concept that’s discussed below. Negligence: People who demonstrate a lack of ordinary care may also be responsible for damages. It is negligence for a schoolteacher to allow children to play with a strange dog, and it is also negligence for a daycare director to allow a non-service animal onto the premises. Landlord Liability: If a landlord knows that a particular dog is vicious or that a tenant has a forbidden breed of dog, the landlord does nothing to address the situation, and someone gets hurt, the landlord may be responsible for damages. Landlords are also liable in certain off-premises animal attacks. Negligence Per Se: If the custodian or owner violated a leash law or other animal restraint law and that violation substantially caused the victim’s injury, the custodian or owner may be liable for damages. Individual cities and counties usually make their own animal restraint laws, so they vary by jurisdiction. In all these situations, victims are entitled to compensation for both economic and noneconomic damages. Furthermore, if there is clear and convincing evidence that the defendant was extremely reckless or indifferent, additional punitive damages may be available as well. Provocation is one of the most common insurance company defenses in dog bite cases, but this defense is sharply limited in Florida. Even aggressive or belligerent teasing does not constitute provocation in a legal sense. Instead, the victim must inflict pain upon the animal to the extent that a violent response was its only alternative. Children under six cannot provoke a dog as a matter of law. If the child was over six and the child’s parents did not properly supervise him/her, that failure could affect the amount of recovery. Many times, the jury concludes that both the victim and defendant were partially at fault. Since Florida is a pure comparative fault state, the judge apportions damages in these cases based solely on the proportion of fault. 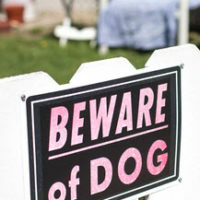 Furthermore, if the victim was over six, the injury took place on the owner’s property, and there was a “Beware Of Dog” sign posted in a conspicuous location, the owner is not liable for damages, even in strict liability cases. Dog bite victims have a number of legal options. For a free consultation with an experienced personal injury lawyer in Brandon, contact Reed & Reed. We have four area offices (St. Petersburg, Lakeland, Tampa, and Clearwater).